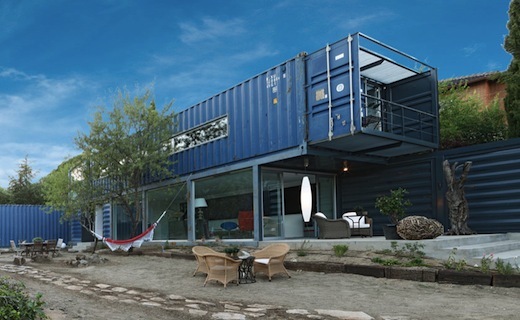 The company uses recycled shipping containers to build these prefabricated, or modular homes, which are unique, modern and sustainable and are collectively known as Montainers. The Nomad 192 is made from a single 24-foot high cube shipping container, meaning it has a higher ceiling than standard containers and measures 192 square-feet. 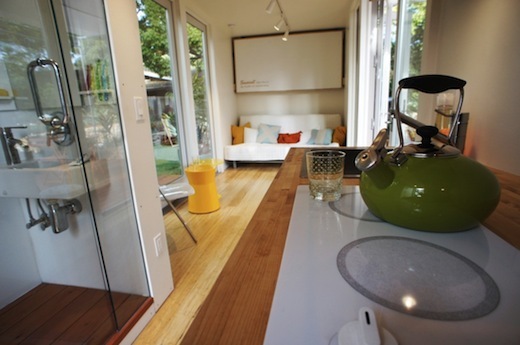 Inside it, there is a fully functioning kitchen, a bathroom with a shower, a living area that doubles as a bedroom. 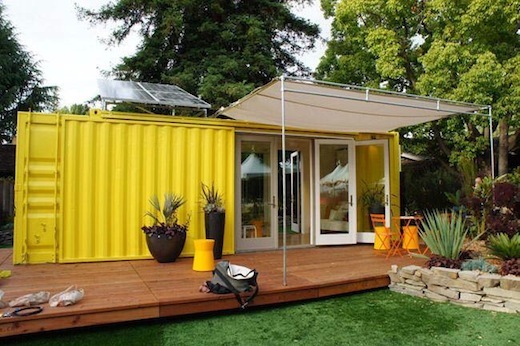 The container also comes equipped with all the necessary appliances needed for comfortable living. These homes are also fully insulated using closed cell spray foam, which results in high R-ratings for the walls (R21), floor (R30) and ceiling (R48). The wall of the two longer sides of the container is removed almost entirely and replaced by large French windows that let in plenty of natural daylight and fresh air. 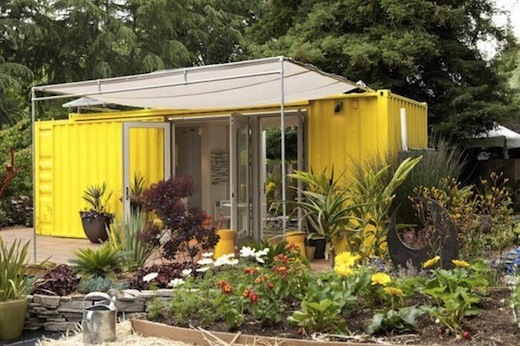 On each of the shorter sides of the container there is also a barn door, which is made from the original container wall, and provides security and protection for the home. When ordered, the home can be assembled on the building site in less than a day, provided the future owner already has a foundation and utility hookups in place. The Nomad 192 meets all building codes. It is inspected at the building facility and approved at the state level through the modular home building department before being shipped out. A fully functional Nomad 192, equipped with all the appliances, cabinetry, and other furniture costs $65,000, which includes delivery and installation within 500 miles of the company’s headquarters. The Nomad 192 would make a great vacation home, or guesthouse, though it could also easily be a permanent residence for a single person or a couple. 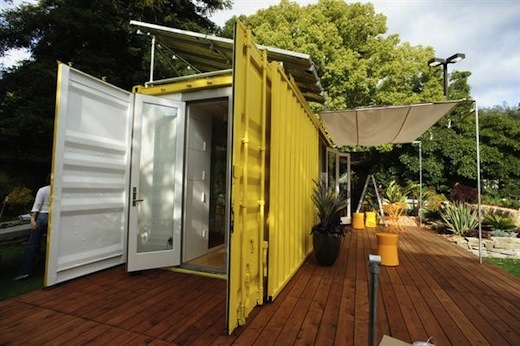 Homebox was designed by the German architect Han Slawik and has the same dimensions as a standard sized shipping container, though the house is not made from an actual steel shipping container. 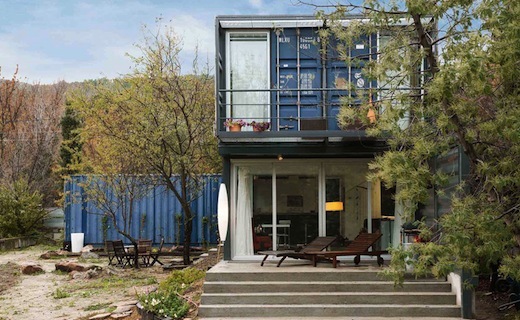 The architect simply took the best shipping container architecture has to offer, but applied it in an easier to construct and maintain way. 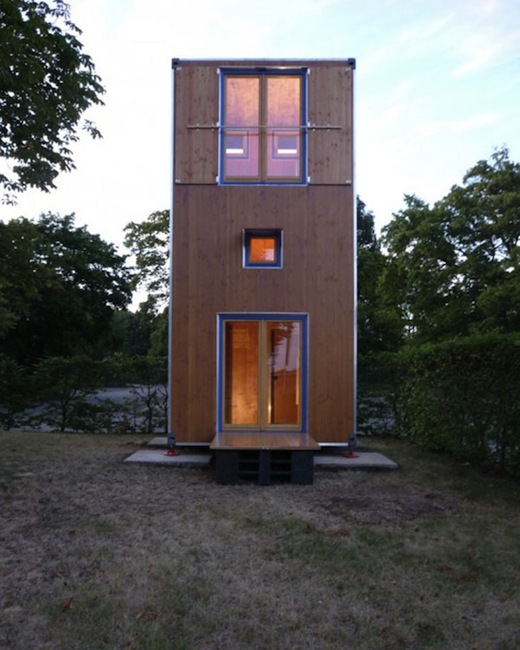 The Homebox is made of wood and designed to be placed vertically to form a three-story home with a tiny footprint of only 75 square feet. The finished house has a living area of 150 square feet, with a kitchen, dining room and bathroom on the ground floor, a bedroom on the second floor and the main living area on the third floor. 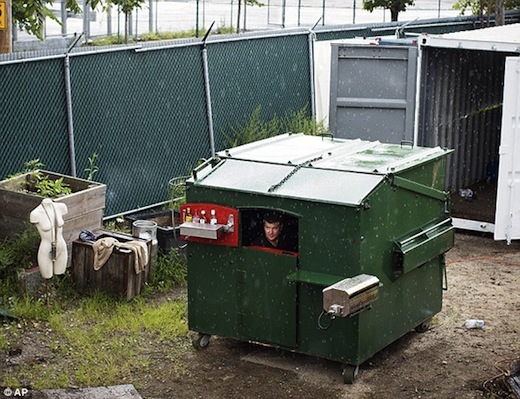 California-based artist and designer Gregory Kloehn, used a new dumpster to build a tiny, fully functional home big enough for 2 people to live in. 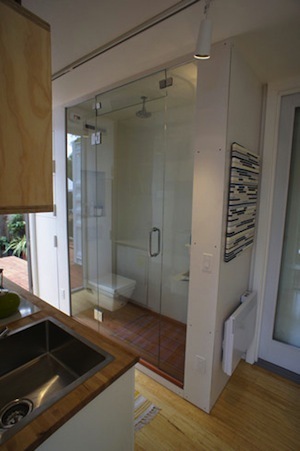 The dumpster cost $2,000 and he converted it to contain a bedroom, bathroom, kitchen and even a sun deck. Gregory started the conversion by cutting out an entrance into the side of the container. He insulated the dumpster with padding and fitted a small sitting area inside it. The living area transforms into a bedroom and there is storage space built into the sitting area. 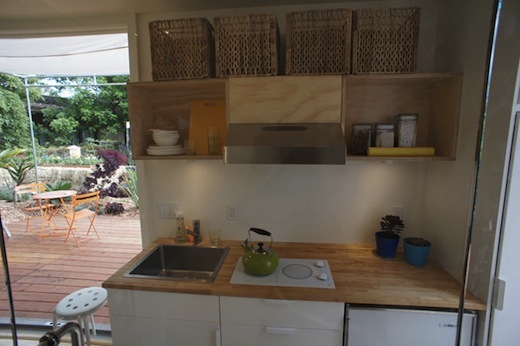 The dumpster also contains a tiny kitchen with a sink, a microwave, and a small propane-powered stove. Gregory lives in his dumpster home when he visits NYC, though the home is also mounted on wheels so it can conceivably be transported to anywhere. 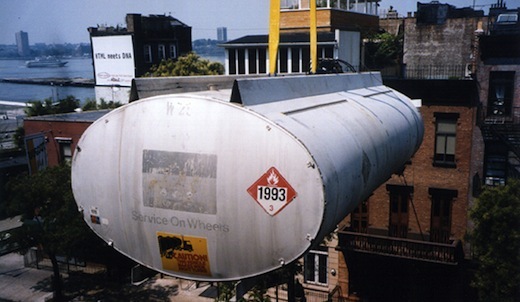 Another great cargotecture inspired home idea is the loft built out of a disused petroleum tank. 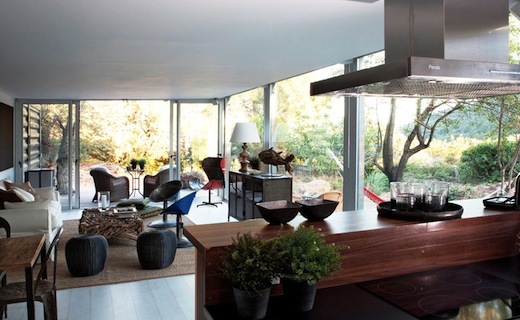 The structure is called the Morton Loft and was designed by the firm LOT-EK. They used the tanker trailer to create 2 sleeping areas and 2 bathrooms, thereby extending the available apartment space of the owners. They first cut the tank into 2 sections, and then suspended the first section, which houses the 2 bedrooms, over the existing living space. They positioned the other half vertically and built two fully functional bathrooms inside it. The interior was coated with automotive enamel. For easier opening and closing of the bedroom doors, they equipped the pods with a hydraulic hatchback door so the occupants need only press a button to gain access to the bedroom. This renovation added valuable space to the 1000 square foot apartment, since the entire downstairs area can now be used as the main living area, which contains the kitchen, living room and dining room. 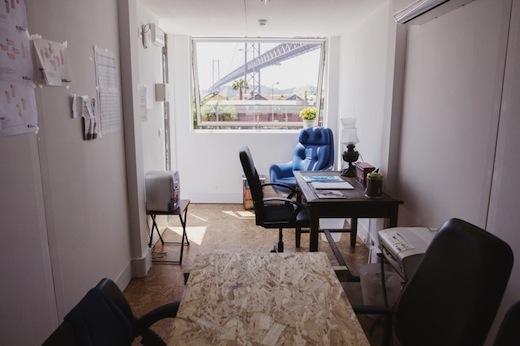 The construction of the Village Underground Lisboa complex is currently underway and they are aiming to open the doors to renters in May 2015. The complex will be built out of 14 repurposed shipping containers, and two double-decker buses. 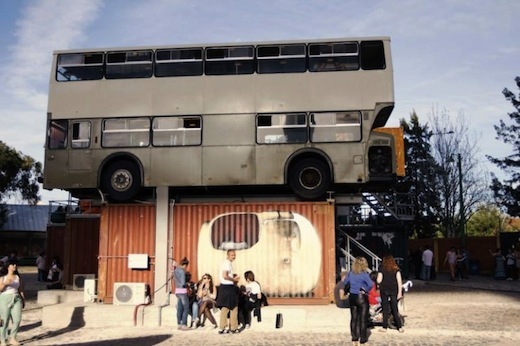 The complex will be located in Lisbon’s Carris Museum, which is the city’s public transport history museum. When completed, it will be arranged into office spaces, a cafeteria, and a central courtyard. 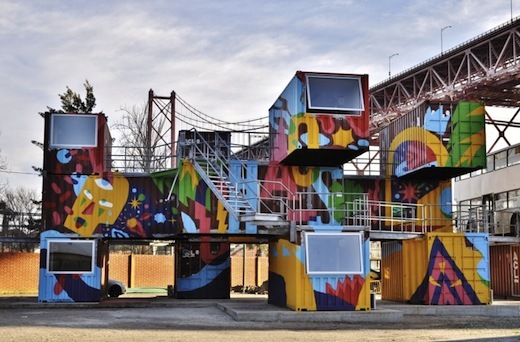 The shipping containers used in the construction have not been altered much, and each of them will contain five working tables, which will be available for rent by startups, artists, and other creative types. The idea is to collect income by charging patrons €150 (about $197) per table, per month. This price will include a desk, Wi-Fi, electricity, and cleaning services. 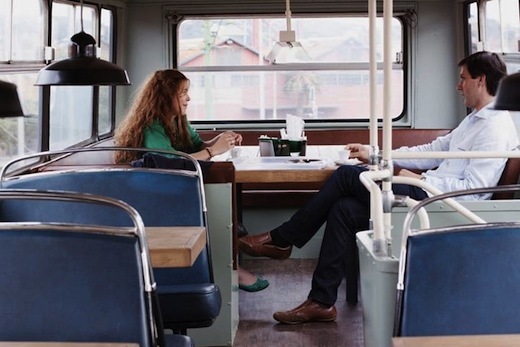 As is the case with most rent-a-desk businesses, the working tables will also be available for rent by the hour, week or some other timeframe. A large cafeteria will be built in the two double decker buses. In the next phase of building the Village Underground Lisboa complex, a stage for concerts and a theater will be added. This will aid in the collaborative projects the organization plans to commence with London’s Village Underground complex. 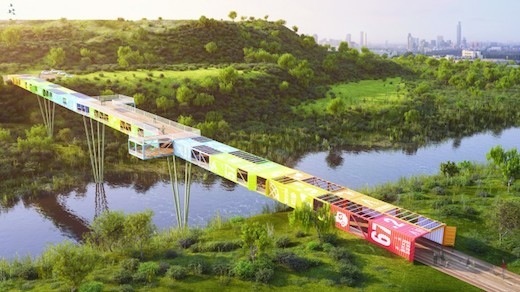 The latter has been in existence since 2007 and is built using recycled trains and shipping containers. 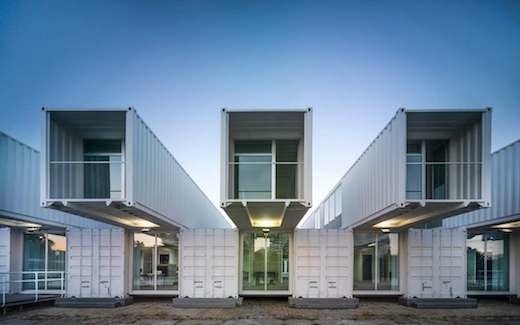 Due to Portugal’s temperate climate, shipping containers are a good fit for building this complex. 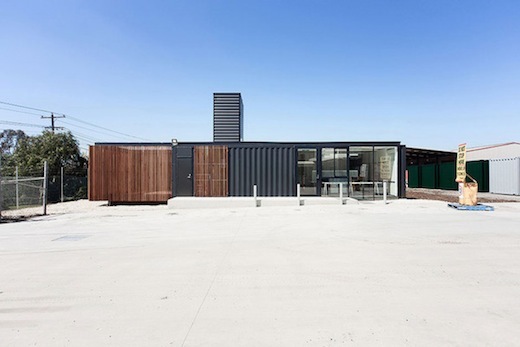 The containers all feature large windows to let in plenty of natural light, while also providing good ventilation. 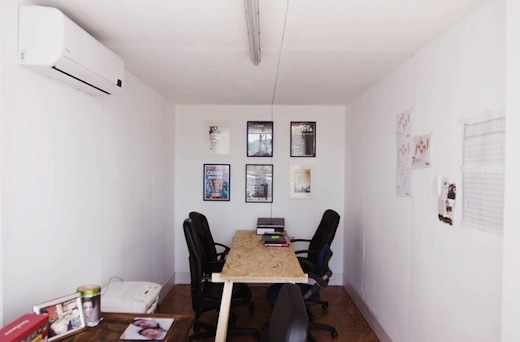 The heat gain in the summer months will be alleviated by air conditioners installed in all the office spaces.